A perfect steak needs very little seasoning, but most grilled foods benefit from oil and herbs as they cook. Brushing the grill with vegetable or olive oil will keep the food from drying out over high heat and open flames. Here are some combinations I like. Perhaps they’ll give you some ideas of your own. Corn on the cob. Blend melted butter, fresh lemon juice, dill and parsley. Place the corn on heavy duty foil and pour the herb/lemon butter over the corn, folding the foil over in a neat packet. Grill for about 15 minutes or until corn is tender. Fresh yellow squash. Combine oregano, basil, chopped green peppers and yellow onions, olive oil and lemon juice in a bowl. Slice yellow squash in thin slices and add it to the vegetable/oil/herb mixture. Let it marinate for 30 minutes, drain, and place the vegetables on the grill. Cook for about 5 minutes on each side. Fresh mushrooms. Rinse and slice about 1/2 pound of fresh mushrooms, pat them dry. In a bowl, add the mushrooms, about 3 tablespoons of olive oil, fresh basil, oregano and parsley. Toss gently to coat the mushrooms. 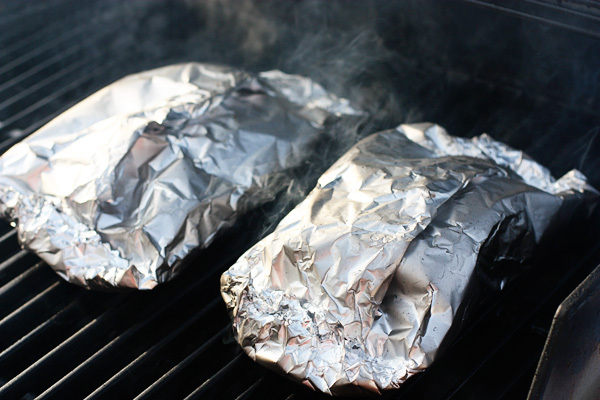 Place the mushrooms on heavy duty foil and fold all sides to make a packet. Grill for about 10 minutes. Seafood: Marinate scallops, shrimp, sole or flounder in a mixture of olive oil, lemon juice, melted butter, fresh tarragon, chervil and parsley. Allow the seafood to marinate 1 hour. Drain the marinade and grill the seafood. About 3 minutes on each side for the scallops and shrimp, and 5 minutes on each side for the sole and flounder. Chicken. I use the boneless, skinless, chicken breasts. In a zip lock bag, add equal parts of melted butter and olive oil, lemon juice, tarragon, parsley, and chopped shallots, place the chicken inside the bag, close it, and give it a good shake. Marinate for about two hours. Grill over medium coals for about 5 to 7 minutes on each side. You can make a tomato sauce marinade as well for the chicken. Use a small can of tomato sauce, a teaspoon of brown sugar, a teaspoon of soy sauce, some chopped garlic, fresh thyme and oregano. Combine all of this in a zip lock bag and add the chicken. Marinate for two hours. Pork chops. Marinate for at least an hour or longer. Use 1/2 cup apple cider vinegar, chopped fresh sage, and a tablespoon of vegetable oil. Combine the ingredients in a zip lock bag and add the chops. Drain the marinade and grill the chops over medium coals for 5 minutes on each side if the chops are boneless, 7 minutes for bone-in. Rosemary skewers. If you’re blessed with large rosemary branches, prune out a few and strip the leaves from them. The branches need to be firm and woody for best results. Gently skewer chunks of pork or beef onto the branches, covering the entire branch with the meat or chicken. Brush the meat or chicken with a mixture of olive oil, dried oregano, and some of the rosemary leaves you removed from the branches. Grill over glowing coals, turning the skewers several times during cooking. What a flavor ! Allow the meat to cool slightly, and remove from the rosemary branches.